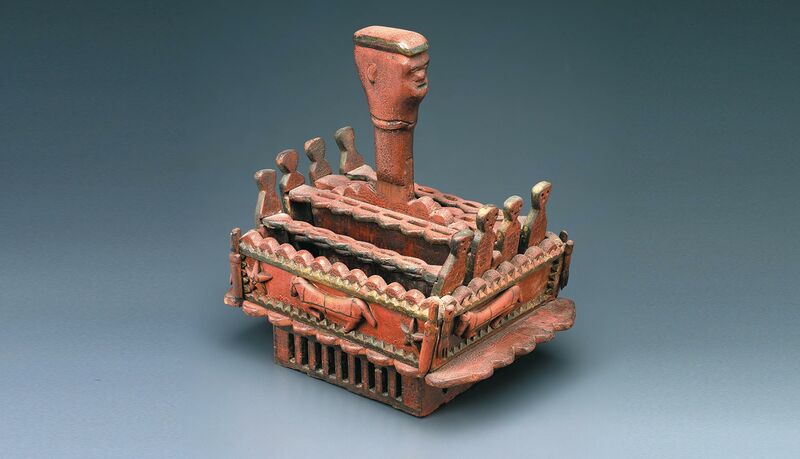 The Fenimore Art Museum in Cooperstown, New York, is known for its premier collection of American folk art. Florence Griswold Museum curators Amy Kurtz Lansing and Ben Colman were given the rare privilege of borrowing the most important works from the collection and interpreting each through a fresh lens. This extraordinary collection of 44 works created by largely untrained early Americans — many of whom left no other record of their existence — will open a window into the daily life and material culture of the American Everyman. The idea of the early American Everyman loomed large in Stephen C. Clark’s eye when he founded the Fenimore Art Museum. Self-reliant and inventive, the historic Everyman represented a romantic ideal of America’s past during a time of rapid change. By bringing together an eclectic mix of objects to reflect this ideal, Clark hoped to celebrate the past and inspire the future. The works of art in the exhibition Art of the Everyman: American Folk Art from the Fenimore Art Museum include folk art made by self-taught artists working with a deeply personal vision and genre paintings by academic artists depicting everyday vignettes. These objects represent a diverse cross-section of American material life, ranging from useful farm implements to portraits that reflect the sophisticated tastes of their rural sitters. The exhibition is divided into two sections, the first, “What is Folk Art?” helps viewers understand how that term folk art came to be and what we mean when we use it. On view is a barley fork (ca. 1900), the object that first sparked an interest in American folk objects for the Fenimore’s founder Stephen C. Clark (1882–1960). Also a pioneering collector of Modern art, Clark was drawn to the tool’s clean lines and elegant form. He assembled the renowned collections of American folk art and painting for the Fenimore Art Museum during the 1940s and 1950s around that aesthetic sensibility, prizing eighteenth and nineteenth century works whose simplicity of design, insistence on line, flattened pictorial space, use of pattern, and vibrant color resonated with the art of his own time in the twentieth century. Clark was interested in objects that would tell stories, a leitmotif for the works in the exhibition. The Van Bergen Overmantel epitomizes the narrative aspect of the paintings that attracted Clark. This celebrated overmantel painting, which is fully seven feet long and 16 inches high, was painted around 1732 and is recognized as one of the most significant depictions of everyday life in colonial America. Set against the beautiful backdrop of the earliest known depiction of New York’s Catskill Mountains, it depicts the complex social landscape of a small agricultural community in the eighteenth century. The wealthy Dutch landlords of the Van Bergen family, indentured servants and enslaved Africans who worked their farms, and neighboring Native Americans populate the intricately detailed scene. 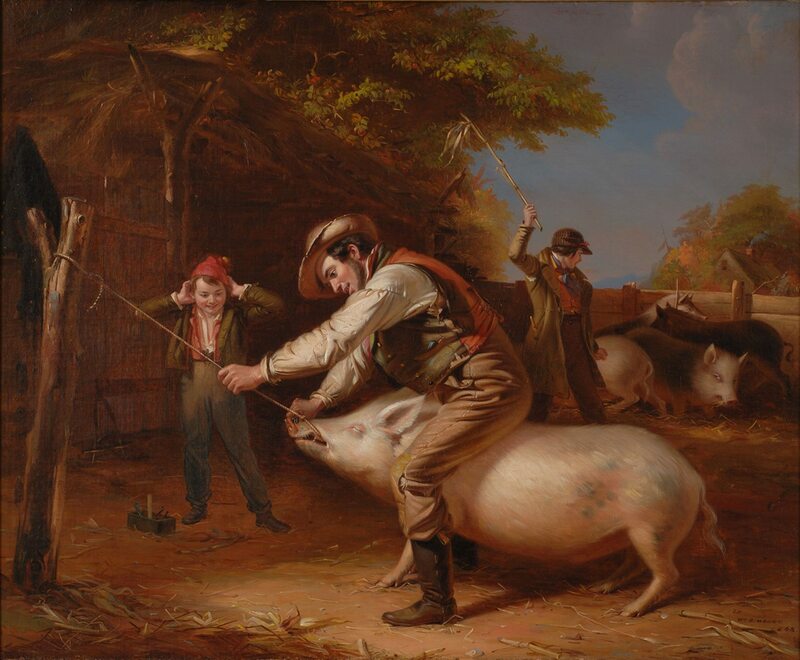 The genre paintings in the exhibit—scenes of everyday life—include iconic examples like Williams Sidney Mount’s Ringing the Pig (1842). Mount, who lived from 1807-1868, knew well the rural patterns of his native Setauket and Stony Brook, Long Island. He drew upon these familiar characters and settings for paintings like this one, showing the once common practice of piercing the snout of a pig with a metal ring so it could be tied to a post. Mount used his masterful touch with material, social, and sonic environments in this deceptively straightforward work. Ironically titled, in this painting the farmer rings his livestock in keeping with local laws pertaining to public order, while the pig’s shrieks ring out with a sound that was as familiar in farmyards as the village church bell. Modern Americans like Clark were drawn to paintings like this for their uncanny ability to evoke the characters, events, and even sounds of a vanishing agrarian way of life. The second section of the exhibition, “Representing the Everyman,” delves deeper into people and stories celebrated in Clark’s vision of folk art. 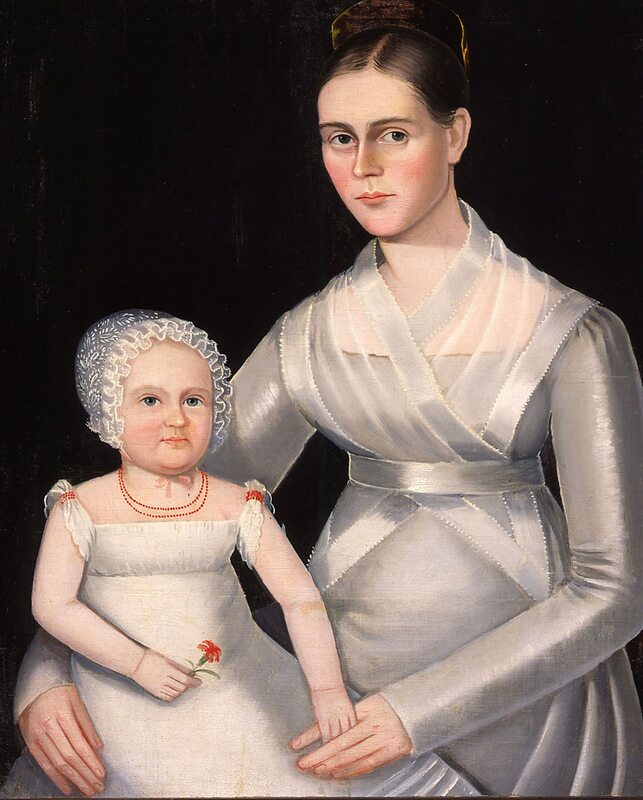 Portraits predominate as both a central feature of American folk art when it was rediscovered in the twentieth century, and an unparalleled window into the life, character, and aspirations of everyday Americans. A painting like James Brown’s 1808 life-sized portrait of Laura Hall hints at the both the ambitions of rural citizens and the skill of self-taught painters who travelled the countryside of the early Republic to sell their craft to eager patrons. This painting, with an imposing scale and meticulously detailed rendering of the subject’s fashionable Grecian dress, is a testament to the remarkable sophistication of early American art made in small communities. It also tells a very personal story. Laura was 21 years old in 1808, on the verge of leaving her childhood home in Cheshire, Massachusetts, to move west with her new husband. Her parents commissioned this portrait to hang in their home as a daily reminder of their beloved daughter. Clark’s selections reflect his interest in social types among the Everyman. The portrait of Charles C. Henry (1851), attributed to Sturtevant Hamblin, captures the great pride Americans, particularly in New England, took in those who established their civic institutions during this period. Although the works in Art of the Everyman were made in different styles and media over two centuries, twentieth-century collectors like Stephen Clark identified a shared sensibility of invention, creativity, and clarity. Appreciative of formal properties such as the smooth planes and crisp angles evident in works such as Ammi Phillips’s portrait of a mother and child, Clark nevertheless prized the stories told by the objects and their makers above all. “We are thrilled that this exhibition allows us to share the stories of some of the finest works of American folk art, and to reveal the role Clark’s eye for Modern art played in defining folk art for audiences today,” said Curator Amy Kurtz Lansing. This exhibition has been supported by grants from Connecticut Humanities and The Hartford Steam Boiler Inspection and Insurance Company. Additional support has been generously provided by a group of individuals, restricted funds, and foundations. WSHU media sponsor.